ورزدار, کرامت, برخورداری, زینب. (1395). بررسی صحّت انتساب رسالة عیون الحکمة به ابن‌سینا. دوفصلنامه جاویدان خرد, 13(29), 171-190. کرامت ورزدار; زینب برخورداری. "بررسی صحّت انتساب رسالة عیون الحکمة به ابن‌سینا". 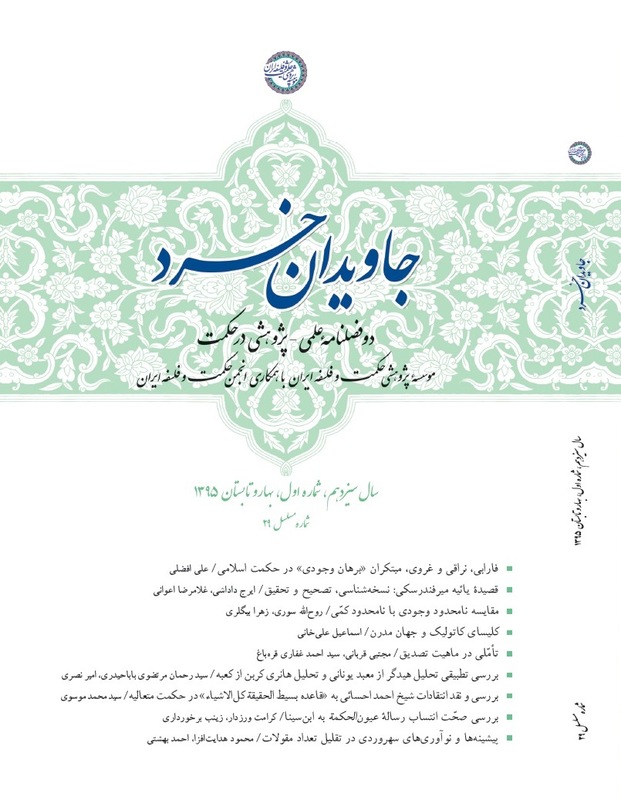 دوفصلنامه جاویدان خرد, 13, 29, 1395, 171-190. ورزدار, کرامت, برخورداری, زینب. (1395). 'بررسی صحّت انتساب رسالة عیون الحکمة به ابن‌سینا', دوفصلنامه جاویدان خرد, 13(29), pp. 171-190. ورزدار, کرامت, برخورداری, زینب. بررسی صحّت انتساب رسالة عیون الحکمة به ابن‌سینا. دوفصلنامه جاویدان خرد, 1395; 13(29): 171-190. 1دانشجوی دکتری رشته فلسفه و کلام اسلامی دانشگاه تهران. 2استادیار گروه فلسفه و کلام دانشگاه تهران. در میان آثار منسوب به ابن‌سینا رساله‫ای با نام عیون‫الحکمة، متفاوت با عیونِ معروف وی که فخررازی بر آن شرح نوشته، وجود دارد که تنها در باب منطق و به سبک منطق دو بخشی نگاشته شده است. در تحلیل این رساله، موارد فراوانی دیده می‌شود که می‫توان به‌واسطه آنها صحّت انتساب این رساله به شیخ را مورد انکار قرار داد. مجازی انگاری، دلالت تضمّن و التزام، موصوف و صفت خواندن موضوع و محمول، تعریف قضیّه به‌صورت «قولٌ محتملٌ للتّصدیق و التّکذیب»، استفاده مکرّر از واژه عرفیه و مشروطه، تقسیم قضایای موجهه با در نظرگرفتن جهتِ امکانِ خاص به‌عنوان کیفیتِ بالقوّة نسبتِ میان موضوع و محمول، تقسیم قضایای موجّهة مرکّبه به دو قسم تک‌سلبی و دوسلبی و همچنین بررسی شکل چهارم قیاس اقترانی و مختلطات آن، از جمله این موارد است‫. هرچند تقسیم قضیه، به شیوه‫ آثار قبل از قرن هفتم است و قضیّه طبیعیّه در آن لحاظ نشده؛ اما شواهد دیگر، زمانِ نگارش رساله را در حدود قرن هفتم تایید می کند. Among the works attributed to Ibn Sinā there is a treatise exclusively on logic which is composed in accordance with the two-fold logical works; this work is called 'Uyūn al-Ḥikmah which is different from Ibn Sinā's celebrated 'Uyūn al-Ḥikmah commented upon by Fakhr al-Razī. In the analysis of this work, there are diversity of instances based on which we could most probably deny its attribution to Ibn Sinā, e.g. metaphorization, signification by partial accord, signification by association, calling the subject and the predicate as the quality and the qualified, defining a proposition as "a statement capable of affirmation and denial", frequent usage of the words "conventional" and "conditional", dividing the modal propositions with considering the mode of specific possibility as the potential quality between the subject and the predicate, dividing the compound, modal propositions into uninegative and binegative, and also inspection of the fourth figure of syllogistics and its combinations. Notwithstanding the division of the propositions which is presented in a similar vein as the works composed before the seventh century, and also the natural proposition which is not included, the other evidence we have highlighted confirms the time of the composition as around the seventh century. One of the Authors of Maqālāt al-Falsafīyyah li-Mashāhīr al-Muslimīn wa al-Naṣārā claims that this work belongs to Ibn 'Assal, but with research carried out among the encyclopedias, no such work attributed to this author is found.